Yolanda; both it’s power and it’s effects have been totally devastating. I need not explain the damage done. But Filipinos will always be resilient and it’s amazing how quickly everyone has come together to help in their own way. Below as compiled from social media feeds (thank you JJ Yulo! ), as of today, is a partial list of generous efforts from the food community wherein restaurant profits will be partially or totally donated from proceeds of sales. So that those of us who are lucky and fortunate enough to eat at this time can still help. I suggest you book your reservations now. And if you know of any more similar efforts, please add them in the comments section. TODAY, November 12, Sarsa Kitchen and Bar in Bonifacio Global City will launch Eat for a Cause. All proceeds from today’s sales will go directly to Yolanda survivors. 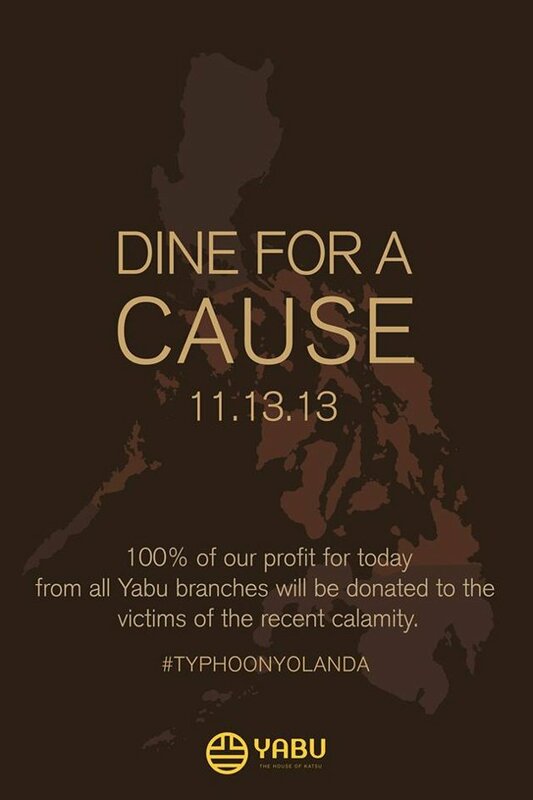 On November 13, Yabu will be donating 100% of the day’s profits from all seven of it’s branches to Yolanda survivors. Tulong Tulong Para Sa Pilipinas! Time to thin out some wallets and fill some tummies! We are hosting a fundraiser on Monday, November 18 at the Visayan Room ( beside XO46 Heritage Bistro along Valero St. in Makati)…featuring a four course dinner (with wine) by Chef Ramon Antonio and XO’s own Chef Tanya. We’re charging Php1,500 a head for this delicious Visayan inspired dinner with a special dessert from Baby Pat. All proceeds go to typhoon Yolanda’s victims. We have limited seats available so please call or send us a private message to reserve a place 5536635 & 32. For the week of November 18 to 30 Nomama will give Php 50.00 for every Nomama Ramen and Php 100.00 for every Wagyu Beef Cheeks ordered to Habitat for Humanity to aide in the rebuilding of homes in Tacloban. Nomama will also pledge 20% of its total sales for the weekend of November 16 and 17 for the typhoon victims. All my restaurants and all of their branches, namely Pino Resto Bar, Pipino Vegetarian, Brgr Burger-Project, Brgy Bagnet and Pi Breakfast and Pies are donating 100% of its profits on sales this WEDNESDAY, Nov. 13, 2013. The following restaurants and vendors support the relief efforts from Typhoon Yolanda by donating 20% of our gross sales from Nov. 16- Nov. 17 to the Philippine Red Cross. Thank you Mr. Jeremy Slagle for spearheading this project. For a comprehensive list of donation and relief efforts click here. *Image from Yabu: House of Katsu’s Facebook Page.